« “The Neighborhood” by Jack Bredin. BRIDGING THE GAP BETWEEN OCEAN GROVE AND ASBURY PARK. Part II: Locking the Gates Across Wesley Lake. New Jersey Ave bridge seen from the OG side. April, 2013. PG photo. Left click for full view. By Paul Goldfinger, Editor @Blogfinger. This 2013 piece brought 50 comments. It is worth re-reading. Every night at midnight, the NTPD locks the gates on the OG side of those two bridges. At 5:00 a.m. the gates are opened. This policy has been in effect since 1995 and was initiated by Neptune Township as a method to stop high crime rates on the bridge and on both sides of the bridge. Many of those crimes were happening in the late evening and early morning hours. The police tried foot patrols, a police substation by the bridge, covert ops and decoys, but despite some arrests, the problems continued. The top priority for the NTPD was to do the right thing from a public safety perspective. Soon after the gates/locks idea was implemented, there was, according to NTPD Chief Robert Adams, a “dramatic impact” on crime in that location, on both sides of the bridges. In 1995 some individuals complained about the idea*, especially from the AP side, who viewed the locks as keeping Asbury Park citizens out. Others said that the purpose of the gates was to prevent criminals from quickly escaping the Grove, but Chief Adams says that cutting off escapes was not the main mechanism. Instead the benefit came mostly from reducing the number of criminals hanging around in those locations, something that would help both communities. In recent years, the police have received no complaints about the bridge closures. Chief Adams says that his department is “constantly re-evaluating” all its policies . However, at this time, he believes that the vast number of Grovers support the continued implementation of the bridge closures and he continues to place “public safety” as the main focus for police work in Neptune Township and, specifically, in Ocean Grove. Public safety should always be the main focus of any community. Isn’t it the president’s first priority to keep our nation safe? So why should it be any different for our community leaders? Keep what has been working! It comes right from Chief Adam’s mouth. I know I feel safer! The Neptune Police lock the gates, then I think they leave town. Sometimes I am up at 4 or 5 a.m., take a walk, and never see a police car. I don’t think they patrol OG at all from midnight to 5. They appear to be fully present at times during the day. I think they need a foot patrol on Bond Street and Lawrence Ave. from midnight to 5, or some kind of discouraging police presence in that location. I live in that location, and know there is foot traffic, and no police presence that I can see. Tom Rechlin, owner of the OG Flower and Gift shop and many year resident of the town, spoke to Blogfinger about this topic before we published this article. But now he thinks the practice should be reevaluated. “We may not need it any longer,” but he acknowledges that he lives at the South End. We live in Ocean Grove, near the beach. The locking of the bridges creates its own safety issue, which is exacerbated by the current lack of a boardwalk route from Asbury Park to Ocean Grove. If we are trying to get home from Asbury Park to OG and the gates are locked, we are now forced to walk all the way through Asbury Park to the “Boulevard” by the gas station and then all the way through a deserted Ocean Grove back home. Or we are forced to wastefully call a taxi. As has been repeatedly pointed out in a different context (FEMA money), Ocean Grove and Asbury Park have intertwined economies, and residents of each town regularly visit the other. Being able to return home after midnight without being forced on a long march is a significant value (according to Google Maps, the direct route from Stella Marina to our house is about half a mile, the Boulevard route is 1.2 miles). on April 24, 2013 at 8:38 am Oh My! The ‘nature’ of the neighborhood across Wesley Lake has changed for the better in the last few years. The cutting down of the ‘ambush hedge’ has made passage from one side to other feel safer somehow. By the same token, Ocean Grove basically ‘rolls up its sidewalks’ by 11 PM so why not keep locking the gates at midnight? The only real Inconvenience appears to be to those who take advantage of the free parking in the North End or escaping bike and metal thieves who have to take a different route. Our home is very close to the gates and we really feel that those gates being locked definately supports public safety. We can attest to the fact that the park still remains a “rough” spot late at night. As for returning from AP – we can use the excercise and OG has not had any muggings recently that I know of. So, Fat Al: It seems that you would compromise security for all so that you can have a convenient route home after midnight from a fancy restaurant in Asbury. I live on the south end of the Grove and still believe it’s better to be safe than sorry. Keep the bridge locked. Why give the criminals a quick escape when it can be prevented? As far as walking home past midnight…geez, there are enough shady characters hanging around the boardwalk during the day, why would you want to push your luck in the middle of the night? FAT AL: I made the same point about the boardwalk access to Chief Adams. He is aware but he doesn’t know the fate of the Casino access. At the present time, even if the CMA builds its asphalt pathway into AP, we are currently stuck because the Casino is closed. So far, I have been unable to determine if the Casino will open for traffic for the season. If it is not usable, you are correct that the access routes will be further limited. You can still go through the Windmill to reach Mt. Hermon or Main, but you can’t get a hot dog after midnight. Of course you can take Main St. to Main Ave. It’s funny that you describe a “walk all the way through Asbury Park” but the OG leg of the trip is described as “deserted.” Give me a walk through a deserted OG anytime. The crime stats speak for themselves (look them up and compare AP to OG). It’s like Dante’s Inferno compared to Wilder’s Our Town. I tried to find out about the Casino(and the bridges) by calling Mayor Johnson of AP and by calling Sandra Dickerson the exec.sec.to the AP Town Administrator, but neither returned my call. Ocean Grovers with whom I have discussed the gates are overwhelmingly in favor of keeping them locked (me too). It may be time for a blogfinger poll. Well, yes, I would like to be able to enter and leave my town on foot and would prefer not to live in a fortress. Imperfect “security” is one of the prices we pay for being able to move around. The ability to walk to, from, and within the town is one of the great attractions of Ocean Grove, at least to me, and its pedestrian-friendly nature is one of the things that distinguishes Ocean Grove from many other shore towns. We can all minimize and disparage each others’ concerns and things that are important to each of us with snark. So Thomas, it seems that you would have us all live in a bank vault without access to neighboring towns, and cower in fear based on some theoretical and unproven “crime prevention” rationale. I’d prefer not to, but you would impose it on me. I give full credit to people’s safety concerns, indeed I share them. It would be nice if others recognized that purported “security” at all costs is not only impossible, but comes with costs, including limiting (at least some of) our ability to enjoy our area to its fullest. Fat Al. You equate locking the bridges from midnight to 5 am as the same as “living in a fortress,” or “in a bank vault” or “security at all costs.” Get a grip Al–you need to lighten up. This bridge policy is nothing like your analogies. Let’s talk about this policy within a framework of reality and skip the hyperbole. It’s an entirely different world in 2013 than it was in 1995 for both communities. I live on the north side of the gates so my perspective is based on the neighborhood and community being built in Asbury Park now – one that features a growth of new developments, well lit streets and sidewalks, and a growing downtown (far from perfect and struggling like all other communities, but certainly moving forward). There are constant police patrols and community watch groups year round on this side of the fence – more than we have experienced from the OG side in the dead of winter. I think the usefulness of the gates has outlived itself – time to take them down. My home is on the South side of OG. I say, keep the gates locked. I live in Ocean Grove and work in Asbury Park. I walk the bridge everyday back and forth with work. Sometimes I work very late hours, and after a 12 or 13 hour shift, I physically cannot walk around all of Ocean Grove to get back to my home by the ocean. I simply climb around/over the gates and I know I am not the only person. That is why there are not as many complaints because it is irritating but not impossible to get by those gates. If people are determined enough to get by those gates it’s easy. But in town that already has a back story of not being acceptable to outsiders, it continues on with a tradition and lifestyle of saying outsiders are not wanted. Crime still happens in Ocean Grove. I have witnessed it. The only way to know of the effectiveness of the gates in 2013 would be to see what would happen if we didn’t. However, we live in a fear-based culture, and many people would rather make life harder for others than risk any personal discomfort. Change has obviously happened on the Asbury side of the bridge. Ocean Grove just refuses to accept that because it means they will have to change as well. People don’t like change. I’m not one to tell people they should not be scared of bad things happening to them and to take preventative measures to ensure their safety. However, you lock the gates on me and I’m just walking home from work. This happens to be a very diverse town—a place of neighborhoods. If you are referring to the occasional culture clashes between the CMA and gays, then you will have to do better than that if you want to condemn all of Ocean Grove. Gay people have been welcomed here for many years. They are homeowners, friends, church goers, neighbors, businesspeople and family people. They are part of the welcomed fabric of OG. So what exactly do you mean? You owe us an answer. Most city pedestrians know the safe from the dangerous streets. I learned which South Bronx streets to avoid; I knew which Harlem Streets were safe; living on 74 St, right off Central Park West, I knew not to go past Amsterdam Ave; walking to work in the morning from the Mid Town Bus Terminal to Macys I knew to avoid 35th. Avoiding trouble is key. Why invite problems?…Keep the gates locked! The Asbury boardwalk just to the north of the Casino, in front of the First Avenue pavilion, is now newly replaced and walkable. I just came from there. I couldn’t see through to the southern end but I’m assuming the Casino will be accessible this summer, at least from the north. Oh i apologize if that came off as offensive. I was referring to the towns history where they locked up the whole town on sundays and closed off the beaches. It has historically been a strictly a religious town with its own set of rules and laws that were not accommodating to people of different backgrounds. But this isn’t about discrimination against any particular type of person other than being a late night person. Like walking those bridges after midnight, it can be done, the town just doesn’t makes it easy. This is the image the town presents of itself regardless of actual content. If you take issue with that, well you should do something to change it. That’s what people want to do by having the gates be unlocked at night. They are not trying to purposefully cause more crime. They want the town to be more friendly and accommodating to our neighbors and our residents. Bonnie – Which of our Asbury Park neighbors should Ocean Grove be accommodating by opening the gates? What would anyone want to come to Ocean Grove for at those hours? No businesses are open. Possibly as a short cut to Bradley Beach? And for what purpose that? Troubling questions… not readily answerable. My daughter comes home from work at night and I worry about some very seedy looking characters cutting through the Grove to Asbury Park. She’s commented that some of them stare at her. Very pleasant people the Grovers, nice architecture, but we are not comfortable were we are. I guess what we are saying, that as newbies and with fresh eyes, you notice these things that maybe others have gotten used to. For some reason Founders Park is a place that interests visitors at that time of night. Also there are OG people who return from where? -to their homes in OG’s north end. The questions are answerable if one keeps their eyes open. Temp: Why move to O.G. if the town doesn’t seem safe? I love these people who move to the Grove and want to change the town. Bonnie: The gate gets locked by Neptune police—you have no idea how crime diminished once the gates were locked. Sure you can edge yourself around the gates to get in or out of the Grove,but if you stole a bike or t.v. it becomes complicated. Most important is if you are walking past the Warrington,or Park View early in the morning hours you are just looking for problems. What is annoying is people come into O.G. because they love the Victorian presence, the calmness of the Grove and the beach, the people— then they want to change everything to suite themselves. Fat Al, if you walk the 1.2 miles after a night of drinking beer, we could start to call you Skinny Al. I do not think any town has the right to lock others out. This is a holdover from the “Blue Laws”. When I was a child no one could go to Ocean Grove on Sundays. As my name indicates, Temporary Sandy Resident, we moved here because we had to; needing an apartment after our house was destroyed. We needed a place that could take us as well as our dogs. Rentals like that were hard to find right after Sandy. We took the first reasonable place we could find, wanting to get into something so that we could bring our entire family back together after living somewhat apart for the immediate two weeks after the storm. We had no knowledge about the neighborhood we moved into. We expected the tight parking situation and accepted that. It is a temporary situation that has just left us uncomfortable. We are not looking to change the town, just commenting on the article and life as we see it. The history on this is that it has nothing to do with “blue laws.” The Camp Meeting approved the locking of the bridge gates after the Neptune Township Police requested the technique when other methods weren’t working to control crime in that part of town. The method is unique as far as separating two towns. Can anyone name another situation just like this one? On the other hand, towns do close certain parts, such as parks at night, for security reasons. This bridge closing is similar to that because there are other ways to get from AP to OG. I agree with keeping them locked; and I frequently visit Asbury at night. I don’t see it as locking people out. It works both ways. People can get into OG by Main Street if need be, just like I have to go that way home when the gates are locked. Yes, downtown Asbury has changed for the better in recent years, but not to the point where I think the gates should remain open. Once again, just who is inconvenienced? All those people streaming into Ocean Grove who frequent the many bars and afterhour clubs on Main? It isn’t an issue of lost revenue, is it? It’s a public safety issue for both towns. Criminals aren’t going to frequent either side of the lake if there is no easy access for entry or escape. Just leave things as they are. I live by the beach, in the middle of town. I love Ocean Grove for many reasons including that people are friendly and the town is walkable including walkable to Asbury Park. Locking the gates these days sure isn’t keeping people from stealing the Century Home signs and sunglasses out of cars and bicycles and everything else that isn’t nailed down, To me the gates indicate a strange separatism, that isn’t consistent with the heart of the town I know. I know people think they make the town safer, but many perpetrators of crimes in the town have come from Bradley Beach and Neptune, as reported in the press. We don’t lock that side of town and we can’t lock the whole town. Gates make me think “gated community”, with all of the connotations of that term. OG is not a “gated community”, at least to me. Unlock the gates. Once again, exactly me and exactly Bonnie, to name two of us who have explained how we are inconvenienced. What’s pretty clear based on the comments in this thread is that there is very little interest in anyone’s inconvenience, or ability to move around on foot, at times when the commenters are apparently tucked in for the night. There is a perfectly reasonable argument that safety in OG is possibly enhanced by continuing to lock the gates. I don’t know the answer as to whether it makes a significant difference under current circumstances, and neither does anyone else. The fact that Bonnie climbs around the gates to have a more direct way home does indeed compromise her safety (I did it once — never again). As for the Bataan death march helping me to lose a few lbs, I fully agree, I’d just prefer to do it in daylight. Joe: There is no history of segregation in OG, unless you are using that word in some unique way. There was, as you point out, a period of time when the OGCMA did restrict who could purchase property in the Grove and perhaps restrict who could rent here. They could ask you to remove your car or your horse on Saturday night or not go on the beach on Sunday, but they did not stop anyone from walking through the town, and even the bridges allowed access to anyone provided they paid a toll–a policy that was eliminated later. I have spoken to Jews who liked to vacation at “bagel beach” (i.e. Bradley Beach). They used to walk through Ocean Grove on the way to Asbury. Many years ago they felt that they would not be welcome in the Grove, but it never stopped them from walking through. Like so many of those kinds of restrictions, they are gone now. There currently is a thriving Jewish community in Ocean Grove. Oy vey! But how does rehashing this old history shed any useful light on the 2013 situation with the bridge closure debate? Doug here from the North End. Maybe a good idea would be to test the waters sort of, keep them open on Friday and Saturday nights during the summer and see what happens. Maybe some TV Cameras on the bridges would be a good idea. A whole bunch of people I know up here come back from AP late at night, and we have had to go around after 12:00. AP is not what it use to be! If things don’t work out, we can always chain them back up!! If I’m coming from A.P. late at night I would assume walking on the boardwalk is the most safe, there are always people walking along, and many nights I see the police parked in the N.End lot and on occasion there is the Citizen Patrol always roaming the streets. Then on the other hand I don’t find crossing the bridge and walking along the lake with vacant building, overgrown hedges and many gloomy and dark areas a safe place to be walking,it’s a no brainer to walk the extra steps to be safe. I also know of three homes near Lake ave. that fell prey to looters. I have even seen motorcyle riders cross the bridge into O.G. to hang out in the back of the Park View last year. Some have tried to refute or otherwise downplay that there has not been a history of exclusion or selective residence in this town. I was merely pointing out that this is not factual historically. If you can walk through the Casino or Boulevard, locking the gates does not impede access to determined criminals. Nor does our open border with Bradley Beach to the south or Midtown to the west. If it was about public safety, then all access to Ocean Grove should be secured at night, gates on both ends of the boardwalk, Main and Broadway, Pennsylvania, Lawrence and Delaware, Boulevard, Fletcher and Wesley lake bridges. 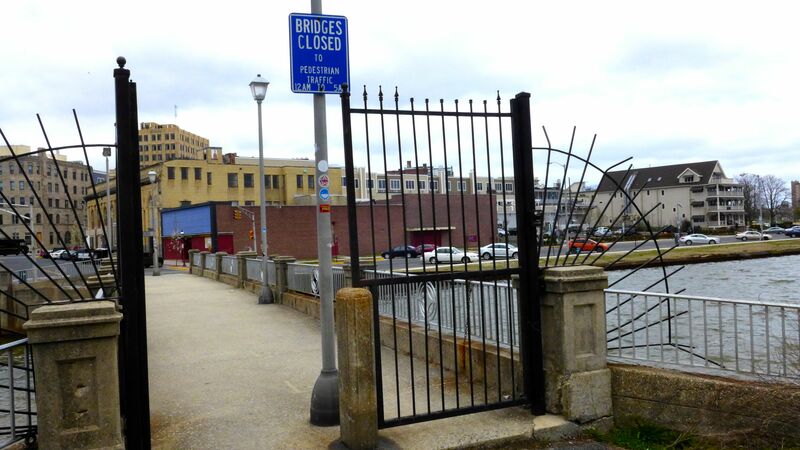 A single locked gate does not serve any purpose beyond standing as a symbol that those on that side of the bridge are not welcome in Ocean Grove. Check the poll question re locking the bridge gates, it is now: YES 154, NO 41. Most see the wisdom of continuing it. Crime dropped so I have to conclude that Bradley Beach and Neptune were not the problem. The sidewalk known as Lake Ave and Founders Park are generally poorly lit, heavily overgrown in place with two large abandoned firetrap eyesores, occupied at times by squatters and partiers (according to some accounts). Isn’t it better to err on the side of caution by having any sort of criminal element have to take the ‘long way round’ because of two locked gates? It is only five hours a day people; get a grip. The NTPD says it cut down on crime, so what’s the problem? So what if some have to take a longer route after closing the bars in Asbury when public safety is the main issue. Keep ’em locked. It’s not about the effectiveness of these gates….and I’d like to see recent numbers. It’s perception. I’m sure the AP council members remarks re: the gates keeping AP riff-raff out was sarcastic – because the gates give APers the impression that OG wants to keep AP riff-raff out. Think about being a member of the community being locked-out/in and how that might feel. The CMA could have said no to the gates but didn’t. Essentially, they supported them. I’m a Grover. Not that long ago, my house was broken into by an Asbury Park teen in broad daylight, while my pregnant wife was sleeping. She looked the kid straight in the face before he left. A quick call to 911 by my wife resulted in his arrest..the bridge gates played no factor. Keep your doors and windows closed and locked, keep porch lights on, and get an alarm system (as we did) if you don’t feel safe. Support community policing efforts. These are all more effective than the divisive gates. I read so many instances of local burglaries resulting from open doors and windows (home and car). Criminals mostly look for convenience, not confrontation. Making it less convenient is a wonderful deterrent, better than gates that result in ill-will between neighbors. Your last two sentences say it all. Thanks for making the case for keeping the gates locked. There is no reason for ill-will between anybody unless it’s between the good guys and the criminals. Guess what, you are also a member of a community being locked-out/in. Unless you happen to have a key to the lock no matter what side of the lake you are on you are equally locked in or out. If Asbury PD doesn’t have a key let’s give them one and let them share the responsibility of locking and unlocking the gate. Some of the comments seem to be from people who have only lived here post the gates, others seem to either not remember or not understand what was happening before the gates, and others make it sound as if the gates are kept locked 24/7 or close to it. The gates serve as a deterrent and inconvenience to criminals and should continue to be locked for the 5 hours each night if not longer during the winter months. It’s 5 hours in the middle of the night, keep them locked! My only regret is that we can’t lock the whole place down and have it be a gated community like Smoke Rise. If the powers that be won’t lock it, then we should at least put up security cameras so that criminals, and their booty can be be clearly photographed. Locking a bridge is great, but we need much more. Cameras work as a deterent and you only have to look at what they were able to do in Boston to understand the investigative power cameras provide. People outside OG have to understand that both AP and Neptune are not very safe places and there is a signifcant criminal element living there. We need the criminals locked out. Jason, OGTS: So then let’s lock up Main Avenue and Broadway. And all the inroads from Bradley. Maybe put up some chains off the beach to keep the sharks away. Or just build a huge wall around OG. Unless you moved to OG over 40 years ago you knew that the surrounding neighborhoods weren’t exactly Holmdel. High crime and low crime neighborhoods co-exist as neighbors in big cities in great numbers without gates. Why do we need them here? Here’s an idea…take down the bridges altogether…no bridges, no problem, right? What say you, fellow OGers, tear down the bridges! Jason – I just read a story from the NY Times in 2003 that stated that the starting home price in Smoke Rise was $450k. Do you want a community that would exclude my family and many other OGers? OGTS, love your “tell it like it was/is” recap of why the gates were put there in the first place. Thank you for your common sense. Our best bet is more Police presence. Perhaps the ground rent needs to go up enough that we can add another, fully dedicated officer 24/7. If we had this incremental police support and an agressive policing posture was adopted (e.g., stopping and talking to anyone who looks suspicious (note to civil libertarians — the police are very good at identifying such people), we would be able to deter the petty crime we are seeeing. Having cameras would help too, as suggested by Jason. This debate is one that has been going on for a few years now. My fear is that the authorities will continue to do nothing until we have a really ugly incident. Then they might do something, but it will be too late. It’s tragic that the criminal element is such a problem. During the 1950s and 1960s and even most of the 1970s, Ocean Grove and Asbury Park were different places. It was a magical time, but that time is gone. I recently stayed overnight in a rental house in Ocean Grove and found that you can slip through the Wesley Lakes gates pretty easily via ducking down and passing through the opening around the cement pillar between them. I’m 6’ 2” so anyone could do it as long as they aren’t overweight. I am from Asbury currently and have lived in OG several times as well as Asbury previously. It is tradition at this point; lots of historical differences between the towns, and a night and day difference after 9pm. Why even question the reasoning other than as symbolic?